Target-setting is rife with worries like being achievable versus stretch, motivating people to pursue them, figuring out how to measure them, the consequences of missing them, how hard it will be to reach them. I’d like to share some ideas with you, about how to lessen the burden when you come face to face with worries like these. Idea #1: Use control charts to indisputably show actual performance compared to target. You haven’t hit the target just because this month’s performance measure value has hit the target. 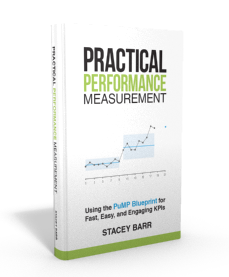 You don’t have to wait until the end of the year to see if your performance measure has hit the target. Good targets are about ongoing capability, not one-hit wonders. Use a control chart and compare the mean line, which represents the current level of performance, with the target. Idea #2: Make sure your measure can be monitored at least 6 times within the target timeframe. Design your measure so you can calculate it as regularly as is feasible, and then set a target timeframe that accommodates frequent enough feedback to increase your chances of staying on track. For example, monitor your measure weekly or monthly for a 1 to 2 year target timeframe. Yes, sometimes you just can’t get data this frequently, but that doesn’t change the fact that a single point of data says nothing. Is it worth setting a target that you cannot honestly know is achieved? Idea #3: Don’t strike a balance between achievable and stretch – do both. What I’ve learned is that it takes practice and confidence-building to achieve a target or goal. Why not set at least two or three targets for any single performance measure? The first one is shorter term and not very challenging, for the purpose of building target-accomplishing momentum. The interim target is an opportunity to build more capability and confidence to stretch. The last one is the stretchy target, which you might have no idea of how to reach at this point in time, but be in a better position to know after you’ve achieved the interim target. Idea #4: Use vivid and specific language to describe the world after the target is accomplished. Numbers alone are hardly enough to motivate anyone. So handing a team a performance measure + target value + timeframe won’t likely be enough motivation. Have you ever tried telling the story about what the world (or at least your part of it) is like after the target is met? Colour, sound, movement, emotion, expression, behaviour, shape, rhythm and all those other sensory experiences emblazon the meaning of the target into the minds and hearts of those setting out to achieve it. Motivation from within is the best kind. Idea #5: Keep one eye on the target, and one eye on the bigger picture. Even if you had enough foresight to explore the unintended consequences of achieving your target before you locked it into your plan, the world will still change later on. I once heard a story about a railway organisation that prioritised on-time running over all other performance outcomes. One day, due to the train running late, the driver omitted an important safety check to save time. The train derailed because of a braking problem that the safety check would have picked up. Every now and then, ask yourself “is this target still a good idea?”. Idea #6: Give yourself permission to learn by not achieving targets. If you achieve every target you ever set, then you aren’t challenging yourself enough. You’re staying inside your comfort zone, inside of what you know works, what you know you can accomplish. That’s not what improvement is about. There is no learning without failing, no improvement without learning. If you want to jump over a creek without getting both feet wet, then don’t aim for the far bank of the creek. Aim for a metre or so beyond it. That way, maybe only one foot will get wet. Somehow, our strides are longer when our eyes focus further ahead. Idea #7: Do some preliminary scoping of “how-to” before locking in the target. If you and your team do not yet possess the target setting and achieving prowess of an Olympic athlete, then avoid setting any kind of target without first exploring a range of ideas of how you might go about achieving it. A very innovative manager I know used simulation software to model his business processes (freight). He made changes in the model to simulate changes like more equipment, different procedures, changing policies. So before he spent a single dollar, he got a good idea about which strategies would best hit the targets. He saved his company many millions of dollars of investment in new trains that weren’t needed. Write down the steps of how you currently set targets. Draw little red stars next to the steps that have problems. Then use the ideas above to write a new target setting process, that could be a vast improvement for you. I appreciate learning from you. At the State of Nevada (USA) Controller’s Office, we occasionally get to help agencies improve their KPI’s. Your mentoring has helped me more than any other resource, over the last couple of years. Also, one of our staff attended your course and shared with me your materials. Your methodology is very pratical and I really like it. I do not understand all of it yet but, I hope to put it into practice the next opportunity I get. Eric thanks for so generously sharing your feedback. I’m thrilled to hear that all my “stuff” is working for you. Perhaps I’ll get to meet you at a course sometime in the future… All the best until then and please don’t hesitate to email an update to me (info@staceybarr.com). I just join Strategic Planning Department in my office, so I’m wondering is there any other best practices in setting the target for KPI? Excellent article. The more I study your material, the more I realise we probably doing stuff wrong in my organisation (i.e. Measurement stuff and our objectives are mostly ‘weasely’. And we always confused when it comes to reviewing them!!! ). Will talk to our Performance Improvement guys and check out their views. Many thanks and God bless you al…. Thanks Sedi. Even if you just try out a few of the tips from this blog, I’m sure you’ll make some very useful progress.